Dancers love good music, and there’s nothing that lifts our spirits more than a band on song, and music that lifts the roof off and sets our feet dancing. Johnsonville’s 2016 celebration of 50 Golden Years, is an opportunity to celebrate not only Scottish Country Dance and dancers, but also our music and musicians. You might say it’s a great excuse for us to enjoy more of the wonderful music that’s available in Wellington – and you’d be right. Looking back through the club’s archives, it seems the first mention of musicians as a feature at annual dances is in 1971 when “Mesdames McIntyre and McGowan, and Mr McIntyre” were to be approached as accordionists to play the supper waltz and a waltz at the end of the evening. In 1974 it is noted that Hugh McKenna played at the annual dance, and in 1980 tutor Glenys Mills suggested the club trial “live” music at club nights. The trial of first a pianist, then fiddle and drums led to a mutually beneficial arrangement with the Wellington Fiddle Accordion Club for live music once a month on club nights. Ken Allan, Ken Budge, John Foden, and Finlay Forbes were all mentioned, although ‘musical director’ Peter Elmes was “not available on Monday nights”. Around this same time (at the end of 1980), Peter Elmes wrote to the Region, advising that The Scotsmen were available to play for annual dances on a flexible basis as a trio or quartet to suit requirements. And so, from 1984, there began a long musical association between Johnsonville club, and Peter as band leader. Musicians John Smith, Merren Simmonds, and more recently Lynne Scott, then Don McKay and Aileen Logie have lined up with Peter and played their hearts out. We’ve also enjoyed the music of Mild Heather (three-quarters of Wild Heather) with Lynne Scott, Anne-Marie Forsyth and Mary McDonald. 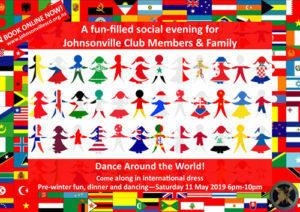 This year, the Johnsonville Club has even more music on the agenda. Peter, Don and Aileen played at our first tartan night this year – what a great introduction to live music for our new dancers. Iain Matcham and Rebecca Warnes played for us at a recent club night – something we haven’t done for many years, but so much fun. Roaring Jelly’s Lynne Scott, Richard Hardie and Jean Malcolm will bring us their music for another great tartan night in September, and for our big event of the year, who else could it be but Peter Elmes’ Band. We look forward to seeing you at our 50 Golden Years celebration dance on Saturday 20 August at Karori Recreation Centre. Enjoy great traditional music from Peter, Don, Lynne and Aileen, and a special programme of Johnsonville favourites from MC Rod Downey.